Here are some resources that will help you get prepared for the #ue4jam. SideFX is offering a FREE 2-month Houdini license to all Epic MegaJam participants. These won’t be available once the jam gets started, so be sure to sign up for your license today! Assembla will give all participants of the #ue4jam access to their platform for game development teams to build iterations of their game using their Perforce and SVN repositories. As a cloud version control provider with PM tools built in, Assembla is an effective asset to any gaming developer, and we are excited to watch Assembla’s continuing emergence within the game development community. To get access to the Perforce server, send us an email that you will need access and your team's email addresses. Please also check out tutorials on using Assembla and Perforce beforehand. GameTextures.com is giving away 30 Free Material Functions, plus offering a 10% off new subscriptions! Find the files and more information on the discount here. Get FREE access to Quixel's Megascans library! Sign up for the Freelance 4K subscription by following the link here. Registration is open through November 15th. Take a look at this "Welcome to Megascans" to help you get started. Chat with other jammers over at the Unreal Engine Epic MegaJam forum thread. Submissions must be packaged for Android, iOS (development packaged builds), Windows or Mac OS. No full, unpackaged projects. VR and AR projects are accepted. Android games can be distributed via the Play store as well. In Unreal Engine game jam tradition, we'll be kicking this one off and announcing the theme at the end of the livestream on Thursday, November 8th at 2PM EST and giving participants the weekend to create and submit an awesome game built in the engine. The jam ends on Thursday, November 15th at 2PM EST. A link to gameplay footage to be included in our highlight reel on the Epic MegaJam results livestream, if you so desire. 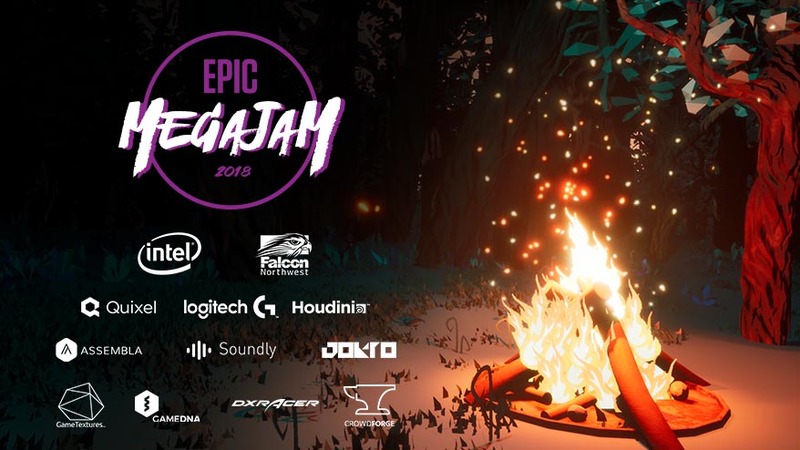 The Epic MegaJam will feature a Grand Prize raffle, plus additional prizes for the finalist teams and special category winners. We judge submissions for their visual aesthetic, unique use of the theme, and gameplay on a 1-5 point scale. The top 3 teams will be declared our finalists. Bring your game to life beyond its platform with Intel's LIGHTSYNC RGB technology! Each member of the team that best enhances the experience of their game using Intel's LIGHTSYNC technology will receive a set of G560 LIGHTSYNC PC Gaming Speakers. NOTE: You don't need a LIGHTSYNC capable device to participate. Simply use their emulator to preview your effects! For help, check out this tutorial on How to Setup the Logitech SDK to work with Unreal Engine 4 Blueprints by Rhys! All entries will be judged for their aesthetic, unique use of the theme, and gameplay. The top three entries will be declared our finalists. They will receive an Unreal Engine swag pack and additional prizes, yet to be announced. an Unreal Engine swag pack per team member, including an Epic MegaJam t-shirt. Many thanks to Intel for sponsoring the Epic MegaJam and supplying our community with rad prizes! We encourage you all to check out their Game Dev Program at https://software.intel.com/gamedev and sign up. They'd love to provide your team with resources to help you succeed -> Get ready. Get noticed. Get big. Each individual from the three finalist teams and the special categories winners will be entered into the Intel Software SSD Prize Raffle, where we’ll be giving away 280GB Intel® Optane™ SSD 900Ps. Each individual from the three finalist teams will be entered into the Intel Software Grand Prize Raffle, where one lucky winner will be receiving a ASUS ROG Strix Gaming Laptop. Our "Special Categories" are for teams who create amazing games, but have something just a little different. On the Go - Best mobile game on Android or iOS! 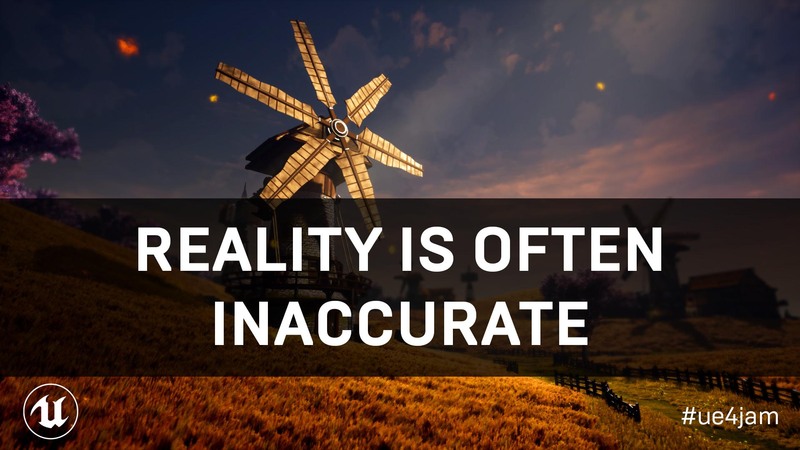 Something Something Reality - Best AR or VR game. Army of One - Best game created by a solo developer. The wonderful Ben Mears of SideFX will be joining our panel of judges for the 2018 Epic MegaJam!